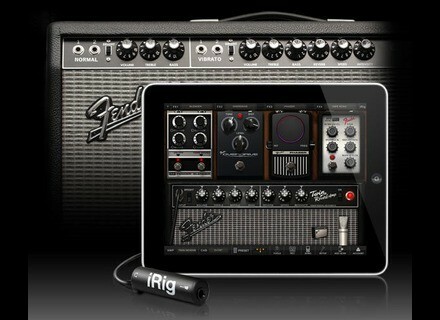 AmpliTube Fender for iOS, Virtual effect for iPhone / iPod Touch / iPad from IK Multimedia in the Amplitube series. 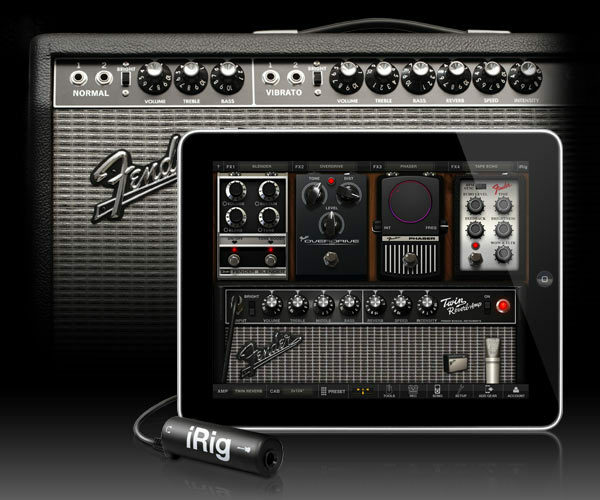 IK Multimedia announced an update of AmpliTube Fender for iPhone, iPod touch and iPad. The new 1.2 version offers MIDI integration and digital audio support, a redesigned recorder and mixer section, audio copy/paste, Retina display graphic updates and more. 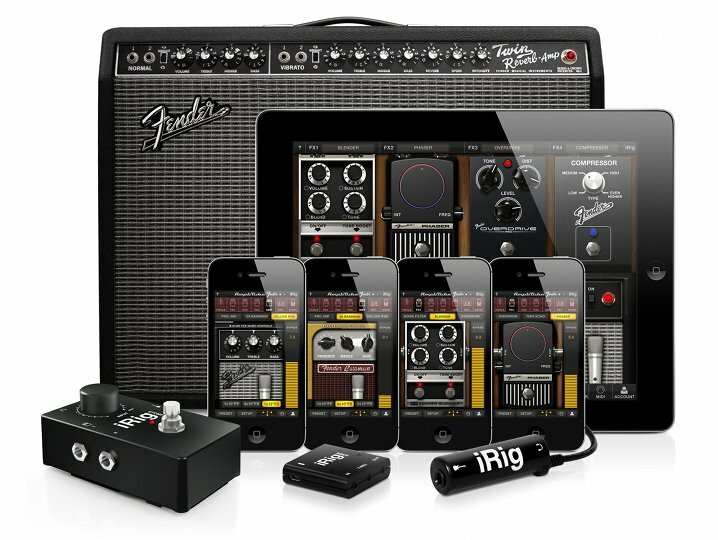 At its most basic level, AmpliTube Fender for iPhone, iPod touch and iPad is a guitar and bass rig that allows players to jam with Fender tone. AmpliTube Fender features amplifiers like the '59 Bassman, the Fender '65 Twin Reverb, the Super-Sonic, the '65 Deluxe Reverb and the Pro Junior, plus Fender stompbox models - the Fender Blender, Overdrive, Tape Echo, Phaser and Compressor. Additionally AmpliTube Fender includes the ability to record and compose entire songs directly within the app with the newly redesigned built-in recording studio. Audio copy/paste is also now supported for copying/pasting audio source material between tracks in the recorder, or entire mixes between apps like Garageband. AmpliTube Fender version 1.2 allows players to control the app using standard MIDI controllers. With a MIDI interface - like IK Multimedia's iRig MIDI - players can use AmpliTube Fender in the studio or on stage by controlling every AmpliTube parameter or preset from their existing MIDI floor controllers or another type of standard MIDI controllers. Also, AmpliTube Fender 1.2 now works with iOS-compatible digital audio interfaces - like IK Multimedia'sStealthPlug USB audio interface cable on the iPad with the Apple Camera Connection kit. MIDI Integration. This feature allows users to control AmpliTube Fender 1.2 via standard MIDI controllers using an iOS MIDI interface such as iRig MIDI. This allows to remotely switch presets or to control each knob, switch or controller on the interface with a physical controller. The feature is available as in-app purchase and it is free for iRig MIDI users. New Mixer section. A new mixer interface has been added to the recorder allowing control of master reverb send, channel level, pan control, mute and solo buttons, plus an FX button for applying the AmpliTube signal chain to the recorded material on the individual channels. This feature also allows "re-amping". New Copy/Paste function. Now users can copy or paste audio materials to and from other apps that support this feature, or copy the content of one channel in the mixer to another channel. Export audio via SoundCloud or FTP. In addition to exporting recorded material using email and file sharing now users will be able to upload and share their materials online on FTP or via SoundCloud. Retina Display support. AmpliTube Fender 1.2 now has an interface designed for higher resolution retina displays both on iPhone and on the new iPad. For more information and video demos, visit www.amplitube.com/fenderiphone and www.amplitube.com/fenderipad. [NAMM] New M-Audio Axiom A.I.R. M-Audio have announced their new Axiom A.I.R. series of keyboard controllers. Steinberg Padshop Pro Steinberg Media Technologies released the Padshop Pro granular synthesizer. Robot Planet BattleComp Vintage Mac OS X Robot Planet has released a Mac OS X VST version of the free "BattleComp Vintage" compressor plug-in.